Is your life too valuable to live like everyone else ? Joshua Becker of Becoming Minimalist recently wrote a post on his blog entitled 10 Reasons Minimalism may be right for you, and while all of the principles I generally agree with, there was one point that really stuck out for me. Is your life too valuable to live like everyone else? Our heart, soul, and passions makes us valuable and unique. Don’t sacrifice your important role in this world by settling for the same temporal possessions that everyone else in your neighborhood is chasing. Your life is far too important… and short. 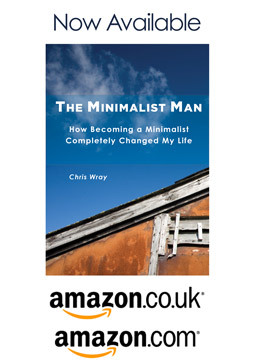 Your particular practice of minimalism is going to look different from anyone else. It must! After all, you live a different life than anyone else. So find a style of minimalism that works for you. One that is not cumbersome, but freeing based on your values, desires, passions, and rational thinking. Ultimately, you will begin to remove the unneeded things from your life. As a result, you will find space to intentionally promote the things you most value and remove anything that distracts you from it. That was is it for me. Yes, my life is far too valuable. Far more valuable to have it directed by others, what a waste of life that would be. To wake up one morning and think, what have I been doing ? In honesty perhaps that’s what happened. Maybe a part of us follows the herd, but I found that things were becoming uncomfortable and that something just wasn’t right. Maybe this was the point I discovered Minimalism. I have a close friend with whom I always end up discussing life the universe and everything. We share the view that ‘Different is Good’ and this blog entry fits beautifully with this principle. When we’re different, we express our ability to be unique, to do things based on our own principles, not to follow the masses, the marketeers and to some extent the establishment expectation. I was sat over lunch with colleagues recently, and whilst I do try not to ‘preach’ my views, one of them happened to pick up a point I’d made and said, “ that’s so you isn’t it, you just have to be different than everyone else”. I’m not going to settle for the possession based lifestyle that others do, I’ve done it. It didn’t make me happy, in fact it made me very unhappy. My life is far too important, and now I have the chance to live to do what makes me happy and avoid all those things that don’t. I love my life, because I get to do what I want, not what others tell me I should want, and I really do get to spend time on things I’m passionate about and people I really care for. My life is far more than valuable, its priceless. If this blog post was useful please let me know your experiences in the comments. I’d be delighted if you mentioned this on twitter. Why not sign up by RSS or e-mail to hear more.